In Omaha, there was rain, lightning and thunder, but further west some areas were hit with hail. Leaves were stripped off of trees and the corn and soybeans also took a hit. Windows were broken and that's just some of the damage sustained from Monday night's storms down here in Utica. A severe thunderstorm came through Utica just before 8:30 Monday night. The storm packed a punch, with wind gusts of 60 miles per hour and up to ping pong ball size hail. Utica fire chief Craig Wolf had checked on his family and was back at the fire station when the storm hit. "We figured about 11 minutes of wind driven golf ball sized hail and most of the town took that at least," Wolf says. The north and west sides of the family's house were hit hardest. "The kids' room is right there, they've got one in the corner on the north and the west, and it took both of them out," he adds. Utica resident Ann Kosek credits her trees for helping protect her siding and windows from being damaged. 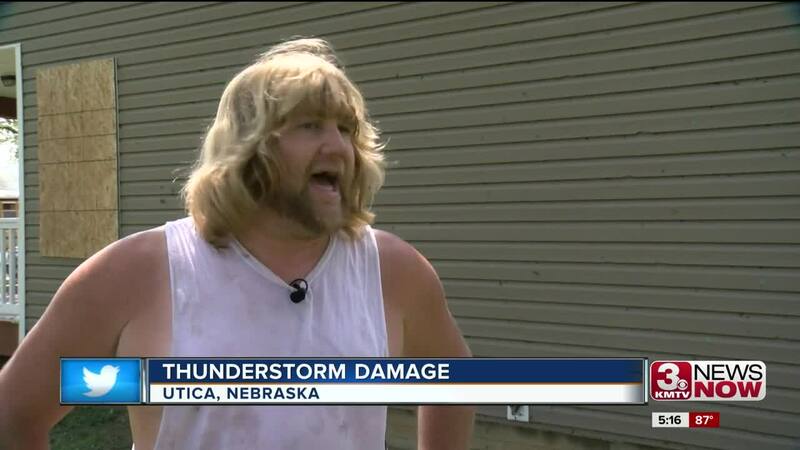 "I actually thought I had windows getting broke out, but I don't know what it was hitting. Might have been hitting the window wells and breaking them," Kosek says. Houses weren't the only things damaged as one church had damage to its shingles and the corn and bean fields also had their leaves stripped from the stalks. While the damage will still take a while to clean up, thankfully there were no injuries reported.